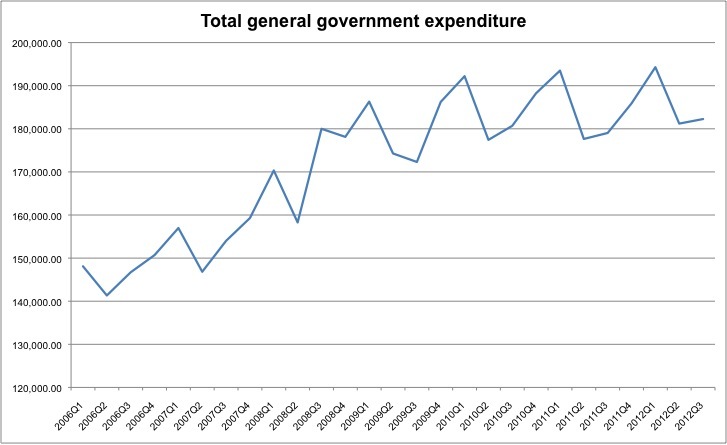 What is general government expenditure? There is some debate at the moment about the most appropriate way to measure government expenditure. I've been especially interested in understanding the differences between the figures reported by HM Treasury, and those published by Eurostat. After several emails with the Office for National Statistics, I now understand where the Eurostat data comes from. This article provides an explanation. Go to the ONS release for "Maastricht Supplementary Data Tables" (the most recent one is January 2013 and can be found here. As far as I can tell there's no stable URL for them so I would suggest entering "Maastricht" into the search box of the index page for all publications). Click on "Data in this release" in the top right corner. Download the excel file for "ESA Table 25 Quarterly Non-Financial Accounts of General Government Expenditure". Select Tab 2501 and look for the column "Total government expenditure" (possibly column T). Note that this measure of general government expenditure includes transfer payments, and it also includes the income from sales of goods and services. The latter are subtracted in order to generate Total Managed Expenditure (TME), a series that is not published by the ONS.